It’s been a while since I posted. I’m not doing well and, even when I have lots to say, it can be too much for me to get over here and write it. And, then, sometimes, when I do, it feels like I’m just listening to the sound of my own voice. And, while I’ve been known to like the sound of my own voice singing, listening to my brokenness sans music can drag me further into a dark place where I am more lonely, more wretched, more pathetic. So, I go long periods without blogging about how and where I am. I’ve withdrawn, with the exception of going to the Acoustic Club regularly to perform. Music is a drive that won’t relent, me being ill or not. And, at least now I have a place that appreciates not only my voice, but my songs as well. All my original stuff has been well received, and that is an exquisiteness. A delight. 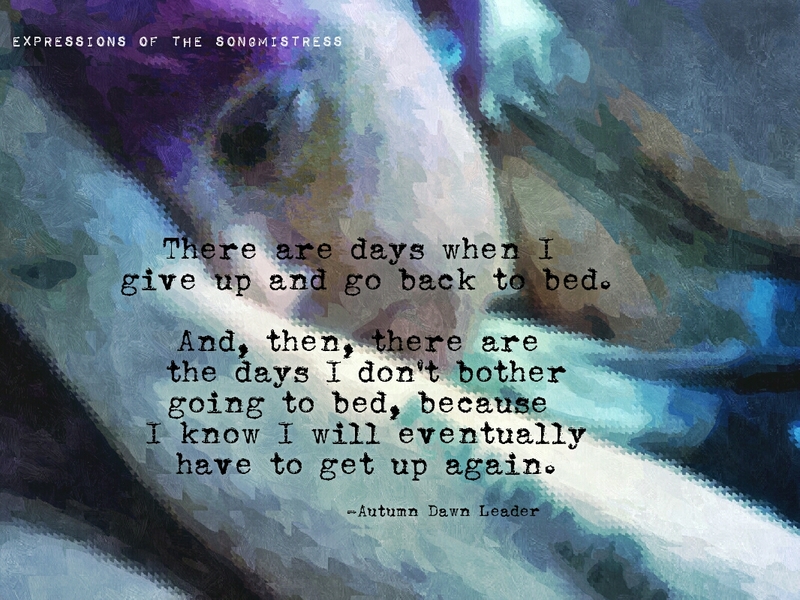 But, yes, I’m struggling…to stay out of bed, to feel anything other than desperation and despair. And, struggling for words to express it all…well, that can just be overwhelming on top of already being overwhelmed. And, yet…here I am…saying something, and nothing at all. I don’t have access to my proper recording equipment and software at the moment (and, there’s no telling when, or if, I will again) so this morning I simply recorded this cover of Matchbox 20’s song on my phone, using the Soundcloud app. I leave you with it, in the hopes that anyone listening other than myself will hear in it whatever it is I’m trying to say.